The 2017 US wildfire season is off to alarming start, with thousands of individual fires having scorched through 2 million acres since the start of the year. That’s nearly 10 times more land burned than what’s typically seen at this stage of the season—and a troubling sign of things to come. According to data presented by the National Interagency Fire Center, there were 10,829 individual wildfires in the United States from January 1 to March 17 of this year. Collectively, these fires burned through 2,062,012 acres of land. That’s a stunning increase compared to previous years. For comparison, at the same point last year, fires had swept through 289,663 acres, and in 2015 through 114,186 acres. Going back to 2006, the annual average is 216,894 acres. As you can see from this graph, we’re off to a blistering start in 2017. To be fair, the NIFC has only been collecting year-to-date figures since 2006, so it’s difficult to know just how much of an outlier the current wildfire season really is. That said, the yearly number of acres burned in the United States has been increasingly rapidly over the last several decades. According to NIFC data, the average number of acres burned from the mid-1980s to 2015 has grown from around two million acres a year to around eight million. Four of the worst fire seasons have occurred in the past ten years, including over ten million acres burned in 2015. Last year, a study from the University of Idaho attributed the startling increase to...wait for it...climate change. 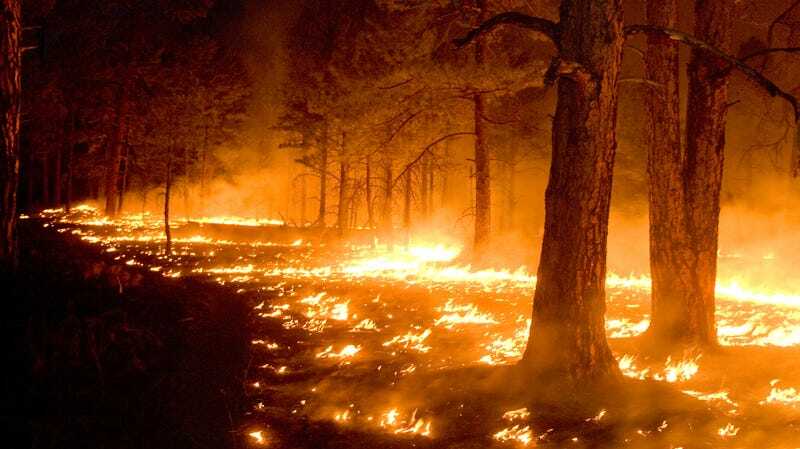 The researchers estimated that human-caused climate change (a combination of warming and drying) added an additional 4.2 million hectares of forest fire area from 1984 to 2015, nearly doubling US territory susceptible to wildfires. It’s important to point out, however, that the causes of wildfires are complex and highly susceptible to human activity. A recent study showed that, between 1992 and 2012, humans were responsible for almost 1.25 million wildfires in the United States, amounting to a staggering 84 percent of all fires. Climate change may be contributing to the amount of territory that can be set ablaze—but we’re the ones starting the fires. In terms of what’s happening this year, the dramatic spike in acreage burned is likely a combination of several factors, including the weather. And indeed, it has been an unusually dry start to the year (except in California—but that’s another story), with parts of the US South and Midwest experiencing less-than-average rainfall. Other areas, such as Kansas, Oklahoma, and Texas, experienced fires that were fueled by strong, dry winds from the southwest. In terms of what to expect in 2017, the NIFC is projecting ongoing fire troubles this month, but things should start to settle down in April, May, and June. Regardless, we’ll be watching. The start to the 2017 wildfire season is hardly encouraging.